Home / News / News / Crisis Communication Plan: What to do when Disaster Strikes. Is it important to have a Crisis Communication Plan? Yes. A crisis which is poorly managed can destroy company value and reputation in a matter of hours. A crisis can and will strike anytime, anywhere and leave a path of destruction in its wake. 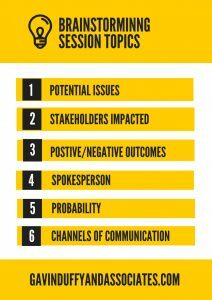 If your organisation doesn’t have a strong crisis communication plan in place, pay attention and follow the steps below as a framework to your communications strategy. 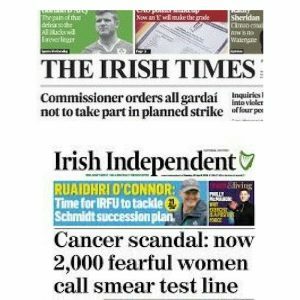 P.S You may think it will never ever happen to your organisation, but the truth is, every organisation is at risk, especially at a time when one damaging tweet can turn into a huge problem overnight for you and your stakeholders. 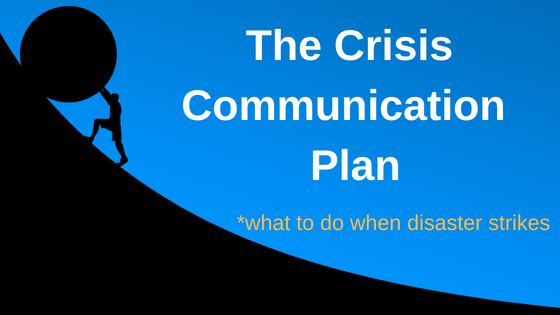 Crisis Communication Plan Step 1: Your definition of a Crisis. One of the most important but very often overlooked parts of every crisis plan. Ignoring or overlooking this step may result in a badly handled crisis, a media battering and unhappy clients. The advice? Prepare for all eventualities. Organise a brainstorming session with key people in your team and create a list of potential crises which could damage the organisation and brand. Outline the main stakeholders who may be affected by the crises and detail how you would react in each situation – the response you will give, best/worst case scenarios. 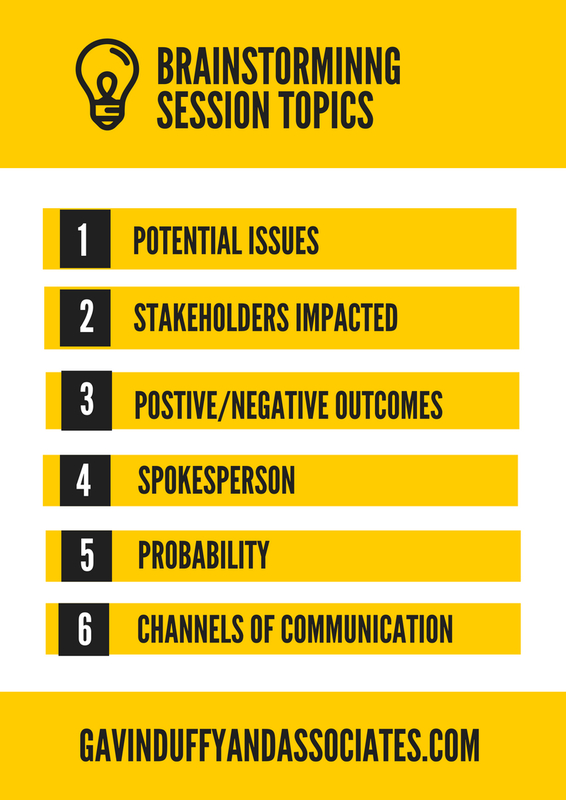 Capture the session using the sample topics below, adding more columns if you wish. This will form the basis of your crisis communication strategy. Investing in a good monitoring system can help stop a small fire spreading like wildfire. 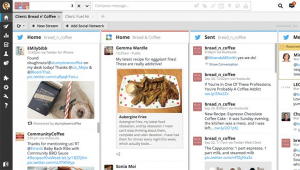 Hootsuite is a favourite of ours for keeping track of what’s being said about the brand across Twitter. It’s incredibly user friendly and best of all you can monitor a few channels for free. There are plenty of free and subscription options out there to suit your organisations needs. It’s also worth taking advantage of the free trial periods before investing in a subscription service. Some programmes and platforms are easier to navigate than others so do try before you buy! Brandwatch have just recently updated their post on social media monitoring tools which is definitely worth a look! Along with Hootsuite we recommend setting up Google Alert notifications – it’s free and delivers any mention of your brand, organisation or product straight to your inbox. A situation may occur where you don’t know all of the facts and are hesitant to comment until the situation becomes clearer. Rather than run the risk of a media frenzy, you can issue a holding statement to inform stakeholders that you are working on the issue, and will have an update as soon as possible. This buys you enough time to gather all of the facts and draft an appropriate response. Update early and often. Issue short statements and keep key stakeholders informed of any developments, minor or major. Keep the channels of communication open at all times. Better the update coming from you than a ‘source’. That’s how the rumour mill starts. When facing the media in a crisis situation it’s imperative that you retain a level of editorial control. While you cannot predict the exact nature of the questions, you can predict how best to answer them. Before any media interview it’s important to choose 3 or 4 key messages to focus on in any given interview. In our media training session we advise clients to find a way to link back to those messages, regardless of the question asked. This is in no way a licence to avoid questions. We always advocate for authenticity during a media interview, however in a crisis situation it is important to use your time wisely and focus on your agenda and not that of the interviewer. Who can forget the DeepWater Horizon Oil spill of April 2010, the largest environmental disaster in U.S history where 11 men lost their lives. Two months after the spill, BP’s Spokesperson and CEO Tony Hayward made a comment in an interview and within weeks resigned from his role as CEO. Tony told reporters “We’re sorry for the massive disruption it’s caused to their lives. There’s no one who wants this thing over more than I do. I’d like my life back”. Two months into the crisis, the interviewer perhaps captured a moment of complete exhaustion from the CEO, however it’s an important lesson for current and future spokespeople in your organisation. It does not matter how much the crisis is affecting you, your company or your personal life, your customers do not want to hear about it. Their only concern is how you fix the problem and improve the situation for them. Everyday minor crises happen in organisations all over the world and are handled internally without public knowledge. 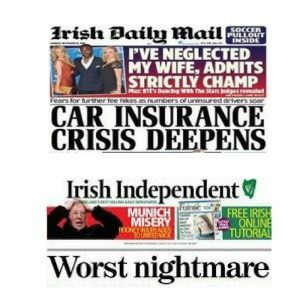 Social media and citizen journalism means that your crisis can become top of the news agenda in a matter of hours. Take United Airlines as an example. In 2017 airline staff demanded that an elderly doctor leave its flight due to overbooking. When he refused, security stepped in and violently dragged the man from the plane in full view of the remaining passengers, and their camera phones. The video quickly became viral, prompting United Airlines and its CEO, Oscar Munoz to address the situation. Unfortunately Munoz misjudged the public mood, and ultimately made the situation worse when he apologised for having to ‘re-accommodate these customers’. The following day Wall Street reported shares in the group were down around 4 per cent, temporarily wiping close to $1bn off the company’s total market value. In a crisis situation it’s important to look at the situation from the customer’s perspective. Take off your organisations hat for a moment, and step into their shoes.How are they reacting to the situation, what are their feeling? Address their concerns in every piece of communication you deliver. Decide on your key messages before you go public. Focus on landing your messages every time you speak to the media. Prepare and review your crisis communication regularly. Invest in media training for your team and main spokespeople. Potential Crisis in your Organisation? Are you worried about a situation in your organisation? Or do you need help preparing a crisis strategy for your team? Our communication consultants, Gavin Duffy and Orlaith Carmody are on hand to plan your response in every kind of eventuality, helping you and your team develop the strategy and recover quickly. Get in contact today using the inquiry form below and a member of the team will be in touch.